A flight at Turtle Stack Brewery. 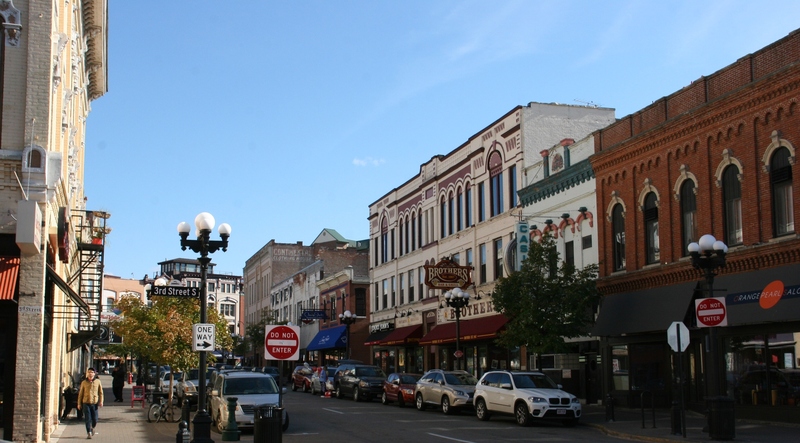 LA CROSSE, WISCONSIN, HOLDS a reputation as a beer-drinking town. 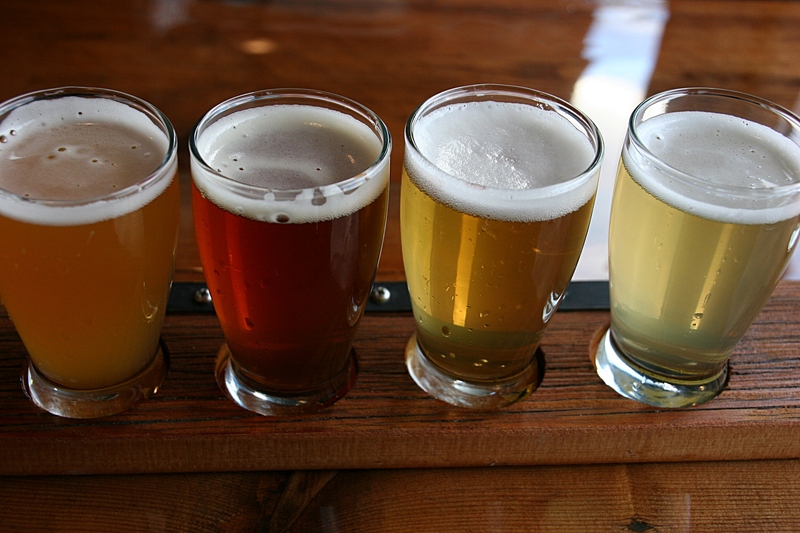 Want booze with your breakfast? 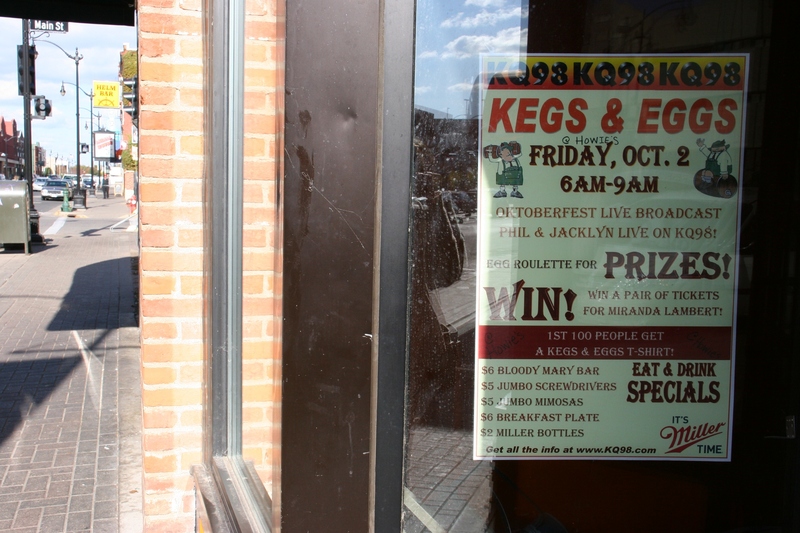 During Oktoberfest you could attend Kegs & Eggs, starting at 6 a.m. Weeks after La Crosse’s celebration of its German heritage, Oktoberfest signs are still posted. Overhead permanent signage also directs you to bars. 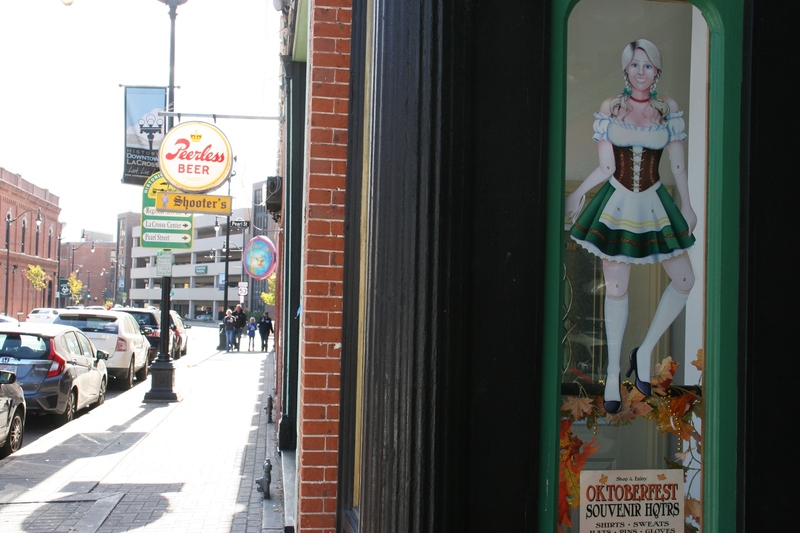 The city’s annual Oktoberfest and volume of downtown bars back that up. Or just ask any college kid in La Crosse and you’ll likely get the same assessment. I ate at Buzzard Billy’s, which includes a bar, and then walked through The Starlite Lounge (a 1950s style cocktail lounge) afterward. I believe all bars in Wisconsin are now smoke-free. Digger’s Sting is a retro steakhouse and cocktail bar. 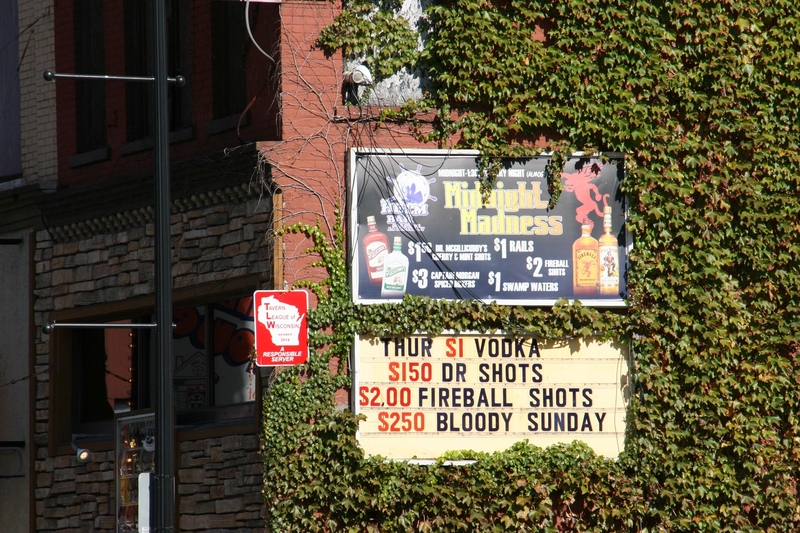 Advertised drink specials alongside a sign that reads: Tavern League of Wisconsin…A Responsible Server. By far the most creative bar signage. I noticed, in particular, how La Crosse bars really try to draw patrons inside with creative signage. 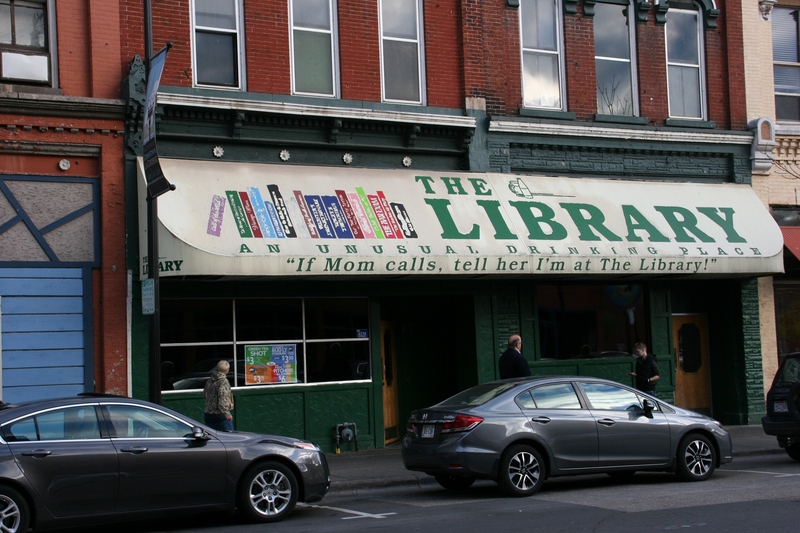 Take The Library, which clearly aims to attract college students via this message bannered across its awning: If Mom calls, tell her I’m at The Library! My second daughter, who attended the University of Wiscosnin, La Crosse, confirms that The Library truly looks like a library inside. She worked at the library. Not The Library. But at UW-L’s Murphy Library. Anyone know how many places sell alcohol in downtown La Crosse? 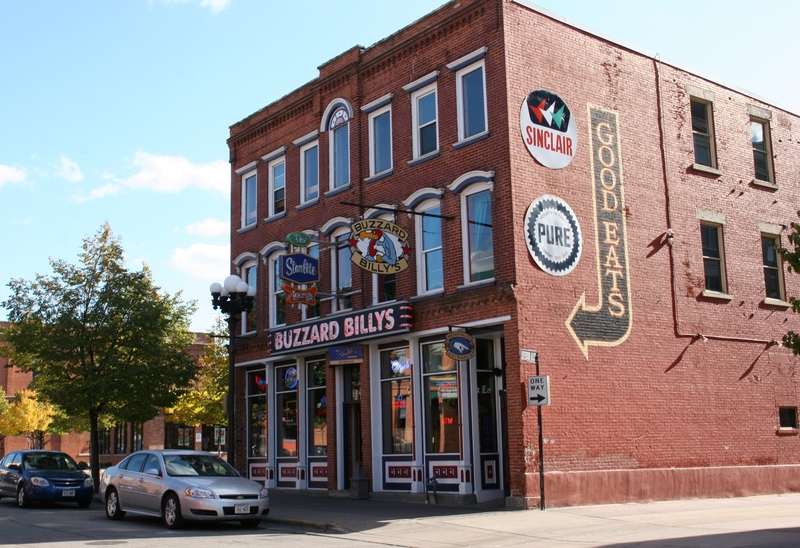 Should you happen to visit La Crosse, take note of all the bars. Try to count them. 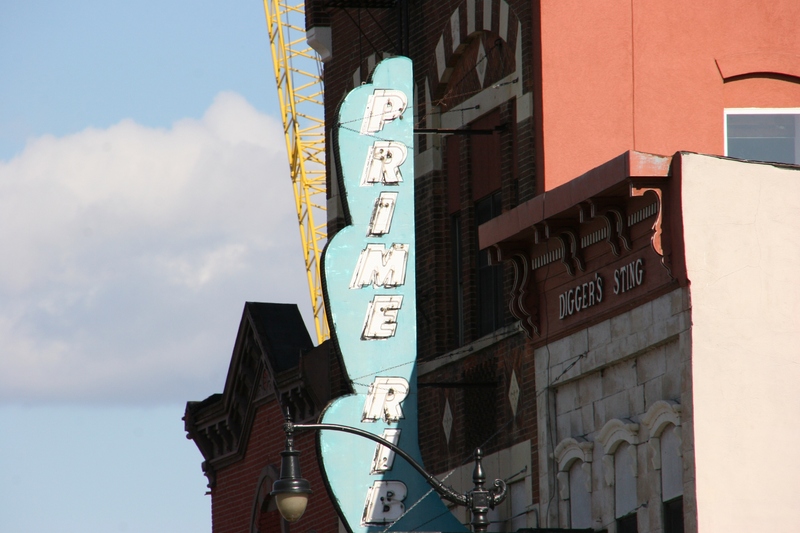 I wonder how many line the streets of this historic downtown. Check back Monday for the final post in my La Crosse series. And click here, then here and here to read my first three posts. Oh I love The Library. What a fun idea for a bar and I am sure many used that line about telling their mom they were there. Not a huge beer drinker but that is a great challenge to count all of the bars. I am sure there is at least one that would suit any college student, right? 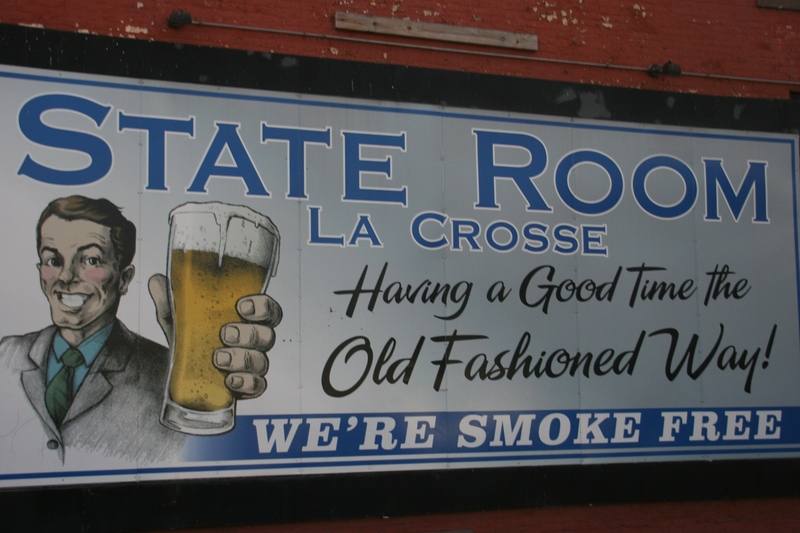 Oh, yeah, pretty certain anyone who drinks could find at least one bar in La Crosse to suit their tastes. Sounds like a fun little town. Love all of the old buildings. That’s the appeal to me– all of the historic architecture. Dinkytown had a bar called The Library too. It must be a popular name for taverns in college towns. My favorite bar idea was a 3.2 joint in Saint Paul that doubled as a laundromat. I hope the Chamber was alerted to your 3 part blogroll. Great job capturing the vibes of the city. Sounds like you ate well too. Your images were crisp and clear. I liked the birds in part 2 lapping up ice cream and send me to the library. Looks fun. And you are right signage was creative. I didn’t contact the Chamber. I usually notice an increase in traffic if that’s the case. Thank you for appreciating this tour. One more post will publish on Monday and then some follow-up posts from the area. “Spot on” post!!! I find it a bit incongruous that our TV stations will do ‘pieces’ on the alcohol/drinking stats (how really seriously bad they are!!!!!) and this all from a station located downtown LaX!!!!!! Such events as Oktoberfest do such a wonderful job of promoting the whole drinking activity (“tapping of the golden keg”, which kicks off the Fest……) and, then, we are told of all the problems/stats that are the result and a bit of “hand wringing” as to what should be done!!! Really???? We stay clear of that part of the LaX “culture”. Very quaint little town, it has a lot of character. La Crosse definitely possesses character. Interesting how you term it a “little town.” To me, it’s not “little” at more than 50,000 people. But then I suppose that depends on your perspective. To me “little” is several thousand or less. Oh, there’s a Library Bar right across the street from where my daughter lives in Dinkytown (U of M – Twin Cities). It’s not quite as inviting as the one in La Crosse! Greg of Almost Iowa mentioned that Dinkytown bar in his comment. Hmmmm. Thank you. It would be a lot of fun to spend time in La Crosse with you and FD. Similar interests for all of us.